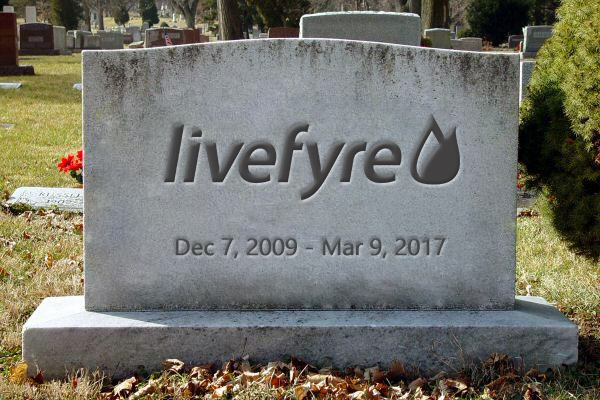 Livefyre quietly announced that they will be closing down their services February 1, 2017 (Update: Livefyre extends services to March 9, 2017). Most owners of Livefyre comments don't even realize this event will take place because Livefyre has failed inform administrators via email of their plans to shut down after the Adobe acquisition. Duckahead depends on Livefyre to create a live social chat room environment in our War Room pages. Livefyre provides three key necessities; 1) new comments show up live automatically 2) the comment structure is editable in CSS for precise visual customization and 3) the comments must be hosted by the service (no software to download since Blogger does not support this). Skip a few paragraphs down if you want to skip to the best solution we found. We looked at several different alternative platforms including a few actual chat services. The chat services either looked like dated early 1990's technology, or required hefty monthly fees for service on par with late 1990's technology. The popular comment system alternatives fell far short of expectations as well. The most popular alternative, which was at the top of our list of consideration until today, was Disqus. Disqus looks and acts much like Livefyre at first glance. There avatars, tree-structure commenting, supports images, videos, etc. It has a like button and even has a dislike button. The ignore author feature also looked promising. But upon closer look, Disqus is not truly live. A user has to push a 'show new comments' button in order to see the latest comments and continue to do so each time new comments are posted. Disqus claims they do this so that the page does not move around while people are typing or reading. They hadn't adopted Livefyre's solution of only showing new comments that are in focus, adding new comments to view as the user manual scrolls up the page. The 'show new comments' button is very disruptive in the liveliness-feeling of our chat pages. Disqus offers new alternative solution in settings to turn it off. This just won't do for Duckahead. Disqus also missed out on necessity #2. Disqus is displayed in an iframe. This means that you as a website owner have no control on how Disqus is displayed aside from the dark or light themes Disqus offers as an option. Disqus also adopts your page's link color. You can apply formatting to the entire iframe surrounding the contents, but you can't format any of the contents within the iframe. With the mass CSS editing Duckahead has done to make the War Rooms a unique live social atmosphere, Disqus is a poor alternative solution. Thanks to the tireless efforts of our beloved Krs, there is another option he discovered in the deep corners of the Internet. It is called Hypercomments. It has avatars, like buttons, dislike buttons, a photo button, video button, link button, emoticon button, editable CSS, is hosted by Hypercomments, has a very clean admin panel which offers the same kind of settings and moderation rules as Livefyre did and then some. Hypercomments will be our new commenting/chat platform starting February 1, 2017. It is almost a perfect alternative. A few drawbacks, the free version only allows one moderator. You can bump up to the Personal Plan for $24 a year, which is a great deal, and have 3 moderators. The price jumps substantially for a package that includes 15 moderators as well as some other features that may serve business-level needs. The 'like' button does not reveal who has liked a comment (some members just want to know who likes them). There are some limitations to traffic in the free plan, but we doubt it will be much of a problem to the majority of free Livefyre platform owners. Also, when users update their names and avatars, users have to hard refresh (Ctrl+F5) the page for the new avatars to show up (clear cache). Twitter links don't post as a twitter comment as they do in Livefyre, but perhaps that feature will be added in the future. You also might enjoy the Pagination setting in Hypercomments. Once turned on, you'll get the option to jump back extra pages to locate older comments quicker. Livefyre will soon be dead. Disqus pops up most on Internet searches as a possible solution but falls well short of satisfying Livefyre owner's needs. Hypercomments is not well known, but it is the best alternative to Livefyre and may even be better in some ways. Thanks again to Krs for finding this gem of a comment system. Compare Livefyre and Hypercomments on Duckahead before February.... Dungeon 1 currently has Livefyre, Dungeon 2 is testing out Hypercomments. Thanks for participating in the score predictions in 2016. Week 13 score prediction results are the best of the season.